It is highly likely that more people have been persecuted or killed in the name of religion than in all the wars in history. 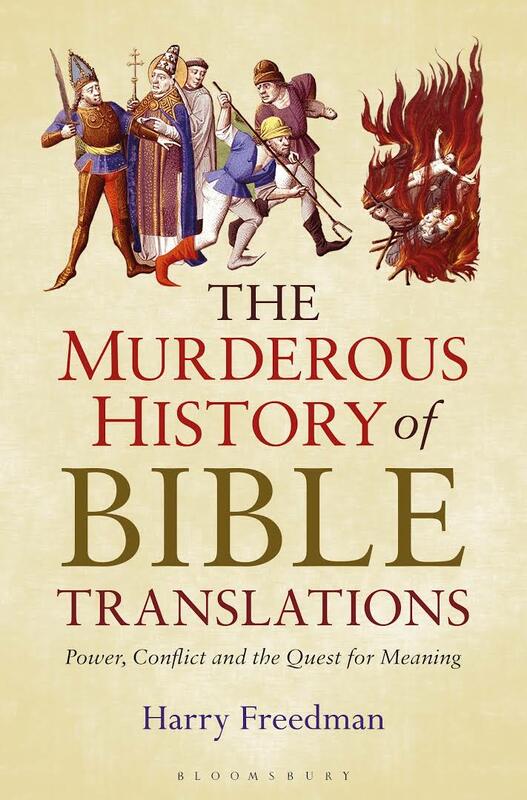 The Murderous History of Bible Translations examines one particular aspect: those killed, not solely due to their specific practice of a given religion, but for translating the Christian Bible into a common tongue. One can suppose with some confidence that other religions were just as effective and assiduous in squelching unapproved translations. Harry Freedman holds a PhD in Aramaic and has written extensively on religious issues in such diverse publications as the Huffington Post, the Jewish Chronicle, and the Encyclopedia of Modern Jewish Culture. He writes an academic narrative that is compelling and accessible to the general reader, yet supports his writing with enough fine research to make it a valuable resource for fellow scholars. Here, Freedman tells the story of people who believed that a Bible that could be read by anyone was an idea worth investing their time, their freedom, and their lives. Three collections of “revelations, histories, prophecies and myths” create the Bible as it is known today. The first is what is known as the Old Testament, or the Bible of Jesus. The New Testament reflects the Christian worldview through the story of Jesus. Finally, Catholics accept the Apocrypha, or Deuterocanonical scriptures. The Murderous History is presented in three major sections. “Before the Violence” relates a concise history of how the Bible came to be. 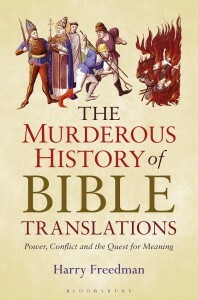 The first translations began almost contemporaneously with its first stories, and the problems began as the original Hebrew was translated into Greek, the universal language of the time. As these Greek translations moved further away from the original Hebrew, Christian leaders charged the Jews with “doctoring” their texts in order to refute the “true” Christian texts. As these handwritten texts were reproduced, minor and major mistakes crept in. Even marginal notes were incorporated into the new texts. The move from Hebrew to Greek created specific problems. For example, Isaiah spoke of a child born to an almah, a Hebrew word meaning young woman. The Greek texts used the word Parthenos, which means virgin. The apostle Matthew relied on the Greek text when he wrote his account so it followed that Jesus was born of a virgin and this became a basic tenet of Christian faith. “The Violence Begins” relates growing medieval conflicts: burnings at the stake and the rise of the King James Version in the early 17th Century. Readers may be familiar with the religious turnabouts from King Henry VIII through his daughters Mary and Elizabeth to King James, who felt he was resolving the issue of what the Bible truly said. William Tyndale was one of the first and most significant translators to die. Arrested, strangled to death, then burned at the stake in 1536, his crime was producing an English language Bible that was readily available to anyone who could read. This was a fundamental problem because it was seen as a challenge to the Catholic Church and the laws of England. Ironically, Henry later split from the Catholic Church and defied English law when he sought annulment of his marriage. Tyndale’s translation was an important element of the King James Version some 70 years later. He was not the last translator to suffer for their actions. In the same year, Jacob van Liesveldt who made the first Dutch translation was beheaded. In Oxford, one can find plaques commemorating the lives of Nicholas Ridley and Thomas Latimer whose lives were extinguished unmercifully at the stake two decades later. The final section, “Enlightenment,” relates the story of the early American Bible and the future for new translations. Even today, there are those who swear only by the King James and do not appreciate the Revised Standard Version or any other edition. In 1663 John Eliot created a version in the Natick dialect of Algonquian, except that it was written in English orthography. Noah Webster created an expurgated version in 1833 that died a mercifully swift death. He only found about 150 words or phrases that he deemed offensive. Julia Smith, the first woman to create a translation, was one of five sisters, all wealthy spinsters who were educated and self-reliant. She taught herself Hebrew and wrote more than one translation for her personal pleasure. When the tax man began to harass her and her sisters, she published in order to prove that a woman could do things no man had done. She was a pioneer in the fight for voting rights, and her translation was unique in that controversy led to it rather than it creating controversy. People are no longer burned at the stake in Western countries, but passions continue to run high. Attempts to create Bibles in which the language is gender neutral have met with limited success. The Revised Standard Version was remarkably successful in removing such language, but the Reverend Martin Luther Hux, a Baptist preacher in North Carolina, burned a page from that Bible to great fanfare in 1952 because it said Jesus was born to a maiden not to a virgin.